I like to keep a pretty fixed schedule for my days so that I can be as productive as possible. In the winter I find it especially hard to get up in the dark mornings, and traditionally I have just forced myself to wake up using alarms. For the last 3 months I have been using a Philips Wake-Up Light Alarm Clock to help me wake get out of bed with a more positive attitude. I used to have an alarm on my phone set for 06:30 every day, but now I have the light alarm set for 06:00. It actually turns on at 05:30 and gradually brightens over half an hour. I usually wake up before the light reaches its full luminosity, and I’m fully awake and ready to go before 06:30 without feeling like I have been rudely awoken. Unfortunately I had to make a modification to the alarm to get it to work the way I actually wanted. Because I got the least expensive version, it didn’t include any options for changing the alarm sound. I don’t understand why this alarm has such an annoying, loud, high pitched beep for something which is meant to wake you more naturally. 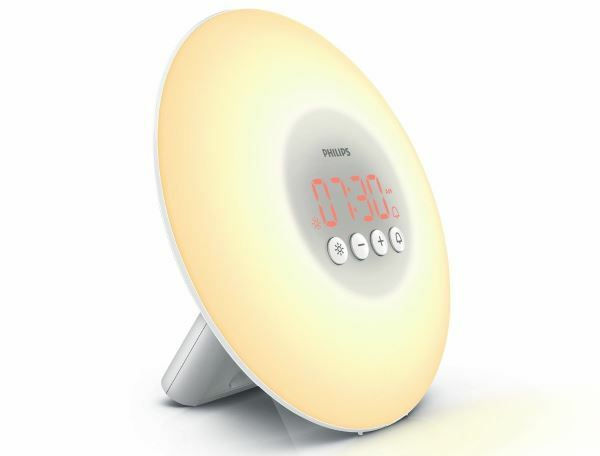 Why did Philips add an annoying beep to an alarm that is meant to wake you naturally? Totally bizarre. I’m really pleased with it now, though there is definitely room for improvement. Philips do make a number of other models in the range, however a lot of them include features like radio that I don’t care for. I’ll certainly be looking at using this method to wake from now on – especially in the winter months.